In China, A Breath Of Fresh Air (In A Can) : The Two-Way Chen Guangbiao is trying to call attention to China's environmental issues by selling clean air. Eighty cents buys you a touch of air from "pristine Tibet." 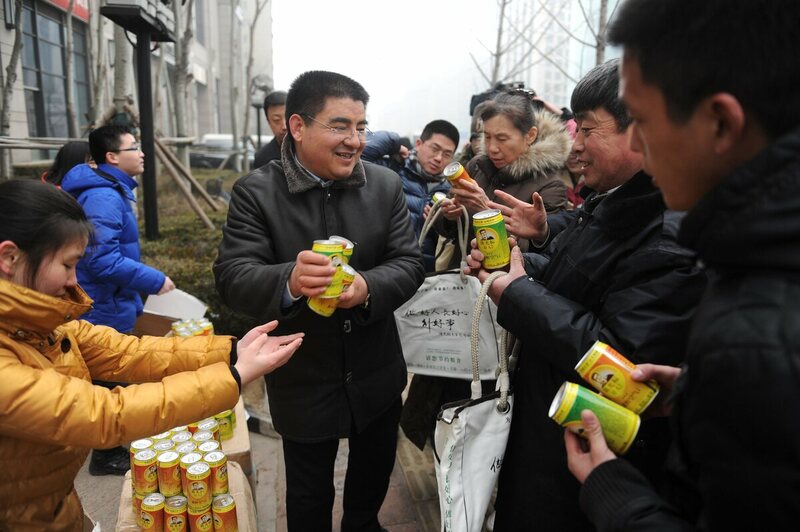 Chinese businessman Chen Guangbiao (center) gives cans of fresh air produced by his factory to passersby for free in a financial district in Beijing. In response to the growing concern over China's air pollution, a theatrical Chinese entrepreneur is selling cans of fresh air. Chen Guangbiao, a multimillionaire, philanthropist and environmentalist, is selling each can for 5 yuan (80 cents) according to the Brisbane Times. Chen isn't trying to make profit off the stunt; his estimated net worth is $740 million. There are different air varieties including: pristine Tibet, post-industrial Taiwan, and Yan'an (early era of Communism). The air is collected and compressed from "revolutionary regions" from Jinggang Mountain in Jiangxi Province to some ethnic minority areas and Taiwan, according to China's Global Times. Chen encourages people to inhale from the can or even drink it. He's using the cans — similar in style to typical soda cans — to highlight the dangerous conditions of air pollution in the country. As we reported earlier this week, planes were grounded in China due to heavy smog, and people were told to stay indoors due to hazardous levels of pollutants in the air. Chen hopes to leave a positive legacy and a cleaner environment for future generations. "If we don't start caring for the environment, then after 20 or 30 years our children and grandchildren might be wearing gas masks and carry oxygen tanks," he told Fairfax Media. In the past, Chen smashed his Mercedes Benz and donated bikes in an effort to raise awareness. Why? "I can only awaken them with my performance art and creativity," Chen told The Guardian.